Technology sector has been one of the market leader for the past 3 years. Investing in best technology sector funds should be part of investor portfolio. 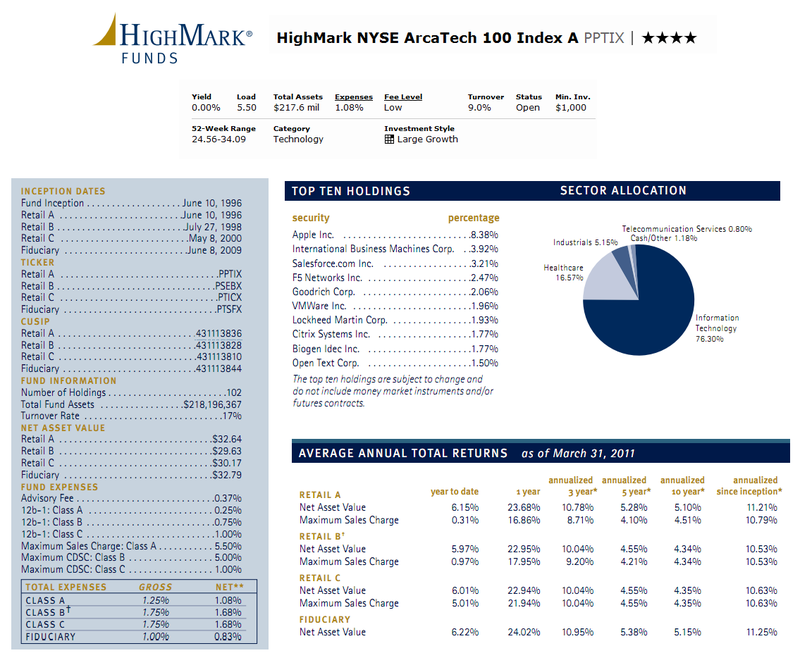 One of the best rated funds is HighMark NYSE ArcaTech 100 index fund. I have provided the fund's review below. The HighMark NYSE ArcaTech 100 Index fund objective is to seek to track the total return of the NYSE Arca Tech 100 Index, before deducting for fund expenses. This HighMark fund invests majority all of its assets in substantially all of the component securities included in the NYSE Arca Tech 100 Index. The NYSE Arca Tech 100 Index, which consists of at least 100 individual technology-related securities, is a price-weighted index of stocks of companies from different industries that produce or deploy innovative technologies to conduct their business. It may also invest 5% of assets in cash. Donald J. Nesbitt has managed this HighMark fund since April 2002. This fund was incepted on June 1996. This fund has 1.08% expense ratio per year. The average expense ratio for the Technology category is 1.67%. Like any typical technology funds, there is currently no yield in this top rated fund (i.e. yield is 0%). The front end sales load of this fund is 5.50% and the 12b1 fee is 0.25%. This PPTIX fund has returned 25.66% over the past one year and 7.89% over the past five years. The best performance of this fund was achieved in 1999 with total 1-year return of 114.64%. The 5-year average return of this fund is 7.90%. It has 10 years with positive performance and 4 years with negative return. Morningstar has granted this fund with 4-stars rating. The other classes of this best rated fund are Class B (Ticker: PSEBX), Class C (Ticker: PTICX) and Fiduciary Class (Ticker: PTSFX). The PTSFX has the lowest expense ratio of 0.83%. The minimum balance to invest in this best technology sector fund is $1,000 for brokerage account and $500 for IRA account. There is a minimum of $50 needed for the subsequent investment. This fund can be purchased from various brokerages, such as JP Morgan, Edward Jones, TD Ameritrade Inc, EP Fee Small, LPL SAM Eligible, Sun America Securities Premier, Northwestern Mutual Investor Service, E Trade Financial, Firstrade, etc. As of March 2011, this PPTIX fund has 102 total holdings. The top 10 stocks of this best rated fund are Apple Inc (8.38%), International Business Machines Corp (3.92%), Salesforce.com Inc (3.12%), F5 Networks Inc (2.47%), Goodrich Corp (2.06%), VMWare Inc (1.96%), Lockheed Martin Corp (1.93%), Citrix Systems Inc (1.77%), Biogen Idec Inc (1.77%) and Open Text Corp (1.50%). The sector allocation of this High Mark Funds is 76.30% in Information Technology, 16.57% in Healthcare, 5.15% in Industrials, 1.18% in Cash and Others and 0.80% in Telecommunication Services.